Kola is aesthetically and weight wise a light chair making it fit both public and private modern interiors. The seat, manufactured of 100% recyclable polyester felt, is part of the supporting construction. It has also great acoustic absorption capacities. The frame is epoxy coated (black, white or yellow) or chromed steel. The felt seat, available black or dark grey, can be renewed which gives the chair a longer life cycle and, accordingly, it leaves a smaller ecological footprint. The upholstered cushion gives extra comfort and allows the use of playful colours. The Kola chairs are fire resistant and easy to clean. 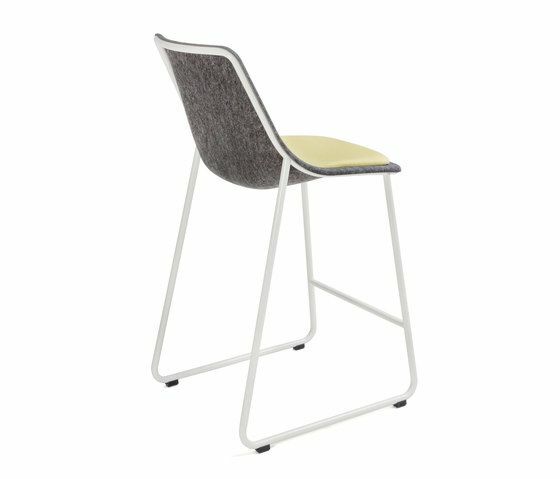 The Kola family includes an easy chair, a rocking chair, a meeting or dining chair with different leg options and a stacking small chair with or without armrests, or with a crossleg for meeting applications. Kola has been awarded with red dot award: product design 2012, Fennia Prize 2012 and Good Design Award 2010. With Kola you can create nice and friendly looking interiors!